For a change, I'll be on-topic. I don't buy much from Harbor Freight (I'm American, but I pronounce this with an exaggerated Australian accent, so, "Harbor Fright"). 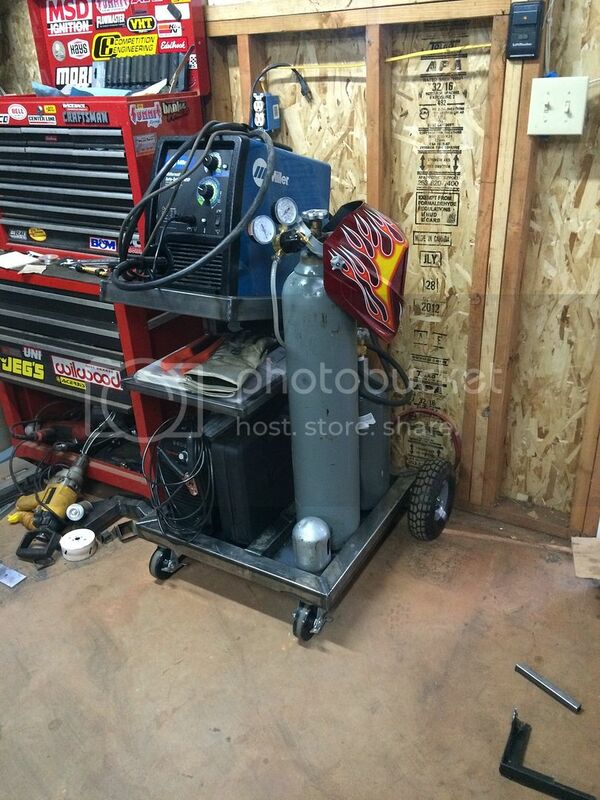 However, I did get one of their red oxy/acetylene bottle carts, the one with the bicycle wheels. I got it cheaper than the usual prices (missing a part), and figured I could hardly buy the metal and wheels for that money. I had immediate need of a cart with big wheels for very uneven terrain, and figured I could add to and improve their cart for my purposes. If you consider this yourself, be aware that some poor former farm laborer in the Chinese factory that builds these things is pre-destroying the bicycle tires by jimmying them onto the rims with sharp screwdrivers or something. The rubber is soft, and the bead areas are getting ruined. Even though they are used with tubes, one of the tires was so bad that the bead area separated so that one tire wouldn't seat on the rim over a ten-inch span. I returned that assembled tire/rim, and the store replaced it without batting an eye, getting another off of a cart still in a box. But when I got the new part home, I removed the tire and tube from the rim (sixty years ago my dad taught little me to rub an inner tube down with baby powder to help it locate itself without any kinking), and I found that the bead of the new tire was mangled like the one I returned. I remounted and aired it up anyway, and (so far) the bead on this tire didn't separate. I was actually expecting to have to replace the factory's tubular axle with a piece of solid cold-rolled (turned on a lathe to the metric dimension) but so far it has not bent. I recount all this in case anybody has the same idea I did. The cart is just passable for the money. You have to add your own hose-hangers and whatever else you want. 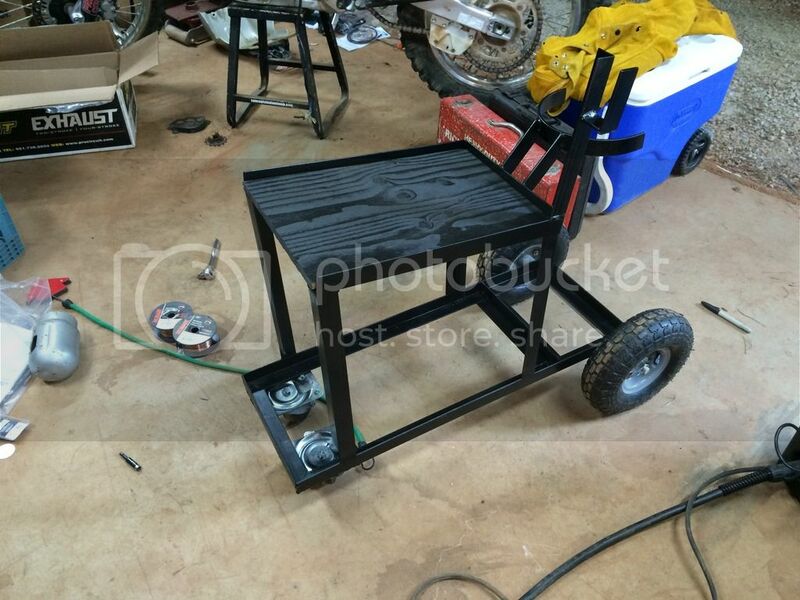 You certainly can build a much superior OA cart from scratch, if you have time and some big wheels. Last edited by old jupiter; 07-10-2015, 12:16 PM. In buying some other welding gear, I acquired a set of those very small O/A bottles. Not the tiniest ones, but the next size up; the acetylene bottle is called a "B"-size bottle, and the oxy bottle is a similar size. I don't know whether to keep them, or when I'd use them, but suppose they might occasionally prove handy, as a friend of mine asserts. So I need to whip up some sort of carrier for them. They are just big enough that taken together, with the hoses and regulators and striker and such, they really should be on wheels and not just a hand-carried frame. Have any of you made one of these? I can certainly figure it out, but am always open to good ideas.  (Yes, I checked with the Search function, saw nothing). Design it in the fashion of a Hand Truck or even just get a small hand truck and fix a way to secure the bottles to it. Simple solution. For single bottles (around the 155 size) that you don't use a lot, here's a real simple solution: a golf-bag cart. My dear departed dad once gave me one he'd found real cheap at a junkstore, saying he thought it might work for welding bottles. I thought it looked pretty flimsy, but eventually tried it, and Dad was right, it works great with no modification at all. Straps at the bottom and top hold the bottle in place, the wheels are big enough to work over semi-rough terrain, and it folds up if you're not using it. Cheap at yard sales, etc. ; I bought a couple more so all my bottles of this size are on wheels. This is obviously not for bottles you use a lot that need to be with a machine, or in pairs, but for example I keep my bottle of 50/50 helium/argon on a golf cart that makes it easy to pull out occasions that call for it. Here's mine that I threw together. The hardest part was connecting all the outlets together. I only run one machine at a time, and it is nice not having to unplug one just to use the other. It is 2" sq 14ga with 2" 14ga angle supports. Topped with 18ga sheet. This was a old water hose reel, I just added some angle and a base and paint. As much as I wanted to keep my welding machines TRUE BLUE, Miller just didn't have what I needed for a current project. 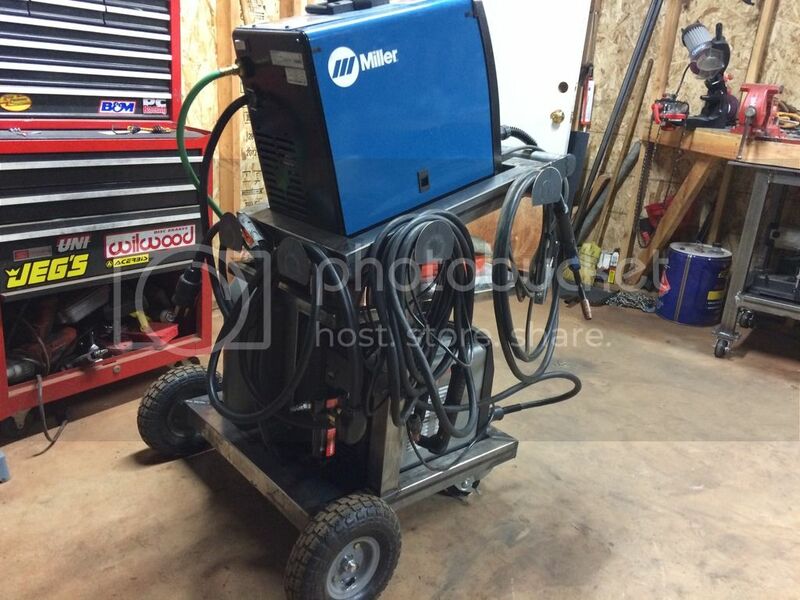 I'd been looking at Miller's spot welders for many years, but waited until a job came in that justified their purchase (I have to sleep with the accountant/bookkeeper, being married to her and all...). Watching ebay, I scored a pretty great deal on a Snap On "one-sided" machine (it's actually a Lenco Spot MKII, marketed at MORE THAN TWICE the price__but I still managed to pick it up for about 1/3rd the cost of a new Lenco, and it's in really great shape, works great!). Well the work cables are short, at maybe 5', so to reach inside the car's trunk, I'd have to put it practically on the floor (bad back, so I work on the cars on a lift, raised enough to limit how much bending over I have to do__getting old still beats getting dead, so I'm not complaining about my back!). All that to say: I made a cart to raise the machine, so I wouldn't have to lower the car! And because it was red, I felt it needed to be True Blue, to match everything else in my shop! Sticks out like a sore thumb! That's what I'm talking about; make it look like the one in the background! 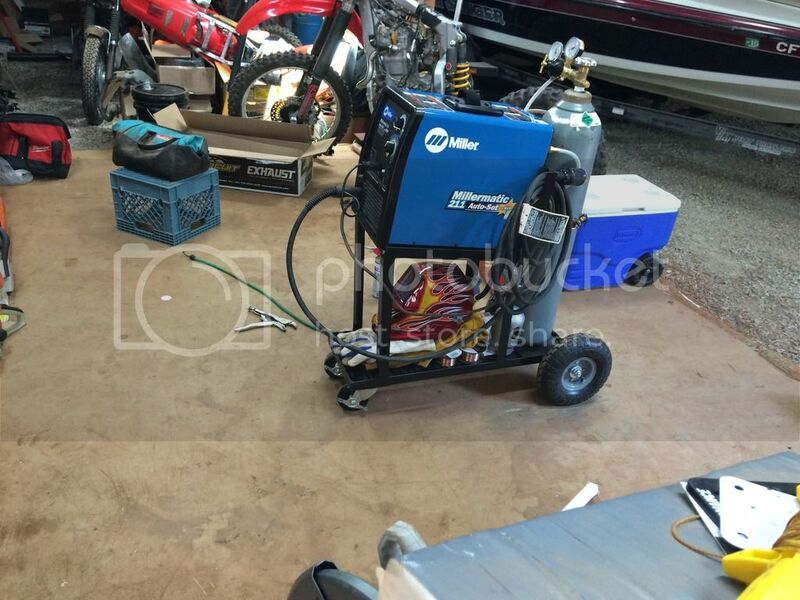 Snap-On/Lencospot Mark II redone in True Blue colors! Clamp-type electrode attachment to use where access allows. PVC pipe "insulators" in case I ever bump the switch putting them back in the pistol-grip holders. I've been putting it to good use the past few days; installing an E-46 M3 trunkfloor assembly in the back of an E-46 (BMW) Touring (aka station wagon) so the owner can complete his conversion of a 325i wagon to an ///M3 Touring__something that BMW never made, but that my customer wanted (and by the grace of money, he can have it!). Here's a small sampling of the spotwelds produced; yes, I'm using 2 or 3 times as many "strikes" as the factory originally did, but spot welds don't cost much money to worry about wasting them! I figured I would throw this out there. 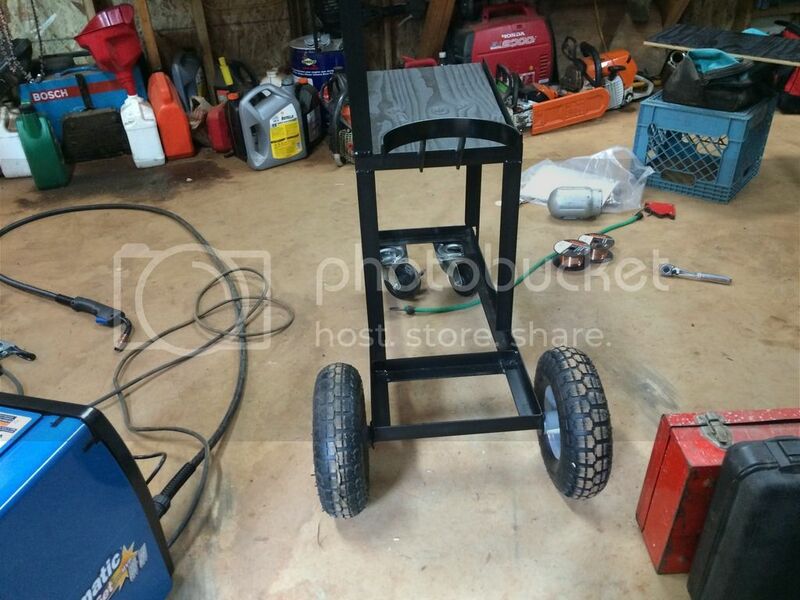 I butchered a cheapo Harbor Freight cart to haul my welding tools and TIG filler (I don't usually buy cheap crap but, I didn't have the heart to butcher a nice cart). 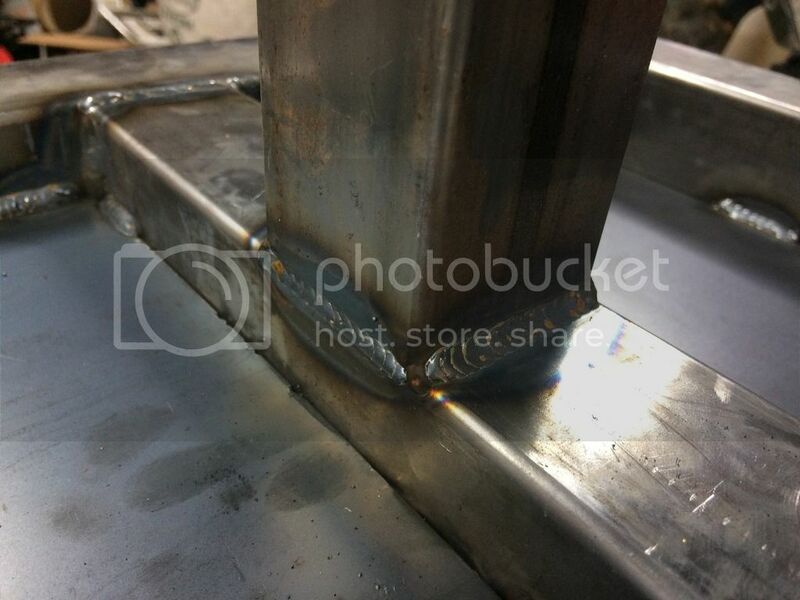 I used PVC conduit for the filler holder. It's not pictured here but, instead of using pvc couplings and a short length of PVC for the rod holder caps..... I use the Bell ends of the conduit cut about 12" long and cap the end. This way the Bell end simply slides over my storage tubes and I didn't have to purchase couplings. Each 10' length makes one tube and can be had for less than $3 plus 2 PVC caps (.66 ea.). Last edited by Ironken; 10-15-2015, 10:40 AM. That sir, is not butchery. That's taking a crappy HF junker and making it useful. Plus you just fed something like 57 chinese plant workers. That's taking global action! Thank you Ryan! That there's funny. Last edited by Ironken; 10-15-2015, 04:11 PM.